BY TIMMY SPAIN – The man in this photo was a true Florida Cracker. Aaron Robert Albritton was his name, but everybody called him Twister. I guess he couldn’t afford a horse, so he trained that steer to haul him around the woods. Those woods are in Hardee, Manatee and Desoto counties. He was born in 1861 in Polk County. (I may well be wrong about the location.) He married Emily Elizabeth McLeod, and they homesteaded enough land to raise 8 children. I don’t know a lot about Twister other than that he was one of my ancestral grandfathers, and the look on the face in this photo seems to me like he wasn’t the kind of man you’d want to get aggravated. 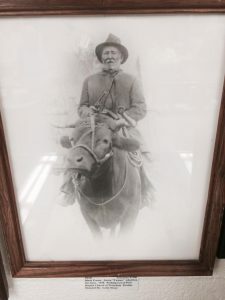 I have been told by my Granny Eva Murphy Watson that Twister rode his steer up to the Johnny McLeod homestead, and Elizabeth saw him for the first time. Granny said that Elizabeth looked at her sisters and said, “That’s the man I will marry.” That is exactly what she did. She was born in Manatee County in 1867 and lived 98 years. She must have been tough. I often wonder what she ate to be able to stay healthy and give birth to 8 children without modern medicine. I do know that she liked mustard greens, because she told Twister she wanted some greens. “Well, woman, I’ll go get you some,” he said. I have feeling he’d probably use any reason he could find to wander off on that steer, so off into the wood he went. “He must have went a far piece on that steer, ‘cause he was gone for 3 weeks, but when he came home he had a little bag of mustard greens with him,” said Elizabeth. As generations went on, one of Twister’s decendants was a man named Marvin J. Albritton, and he married Nealie Youngblood and they had two children, Marvin Jr. and Marvenia. Everybody called Marvenia Aunt Denar. Aunt Denar loved to fish, and maybe that’s where I get my love of fishing from. Marvin Jr.was born in Hardee County in 1928 and married Eva Jane Murphy of Ona, Florida in 1955. They had two girls, Marti and Sherri, and lived in Lake Placid, where Marvin works as a game warden. During the 1960s they had more airboats than they did trailers, so they had to share them. It was common practice back then to wet the grass in front of the boat in your yard and winch it up onto the trailer. On August 18, 1966 Officer Albritton was putting his airboat back on the trailer like he’d done many times before, and tragedy struck. The bow cleat broke, causing the hook from the winch to hit him and take his life. I met a FWC officer a few years ago and told him about my grandfather Marvin, and he went on to say that it is still talked about during the FWC training in Quincy, Florida, where the training facilities are located. Albritton is a very old name in Florida, and there are several sections of the family. If you dig deep enough, you might find that they are all related somehow. In honor of Twister and the Albritton family, I created a public Facebook page called “The Albritton Family,” and to me it’s like watching a social media family reunion. I’ve seen posts that include words like 8th cousin, and wow, I just found another cousin. I hope you enjoyed this brief history of my mother Marti Albritton’s family. If you happen to see me on the island sometime, please say hi and ask me about Bone Mizell. If you know that name, you’re either a Florida Cracker like me or you like Florida history. I’ll talk you ear off about the my take on Bone’s way of thinking.